Limburg mustard soup is a delicious start to a Dutch supper. Limburg mustard soup is a little different, not spicy hot, and so easy to make. Can you get coarse unprocessed seeds? Holland isn't known for its cuisine. Take a walk along the canals of Amsterdam or Delfshaven in Rotterdam and you'll only find restaurants providing Indonesian, or Lebanese or French and Italian foods. But this Limburgse mosterdsoep from the Maastricht region is just delicious. It's quite a rich soup, so make sure you follow it up with a meal of salads or vegetables, or your cholesterol will rocket! Or just leave out the cream. One litre of chicken bones bouillon, see below how to prepare. Five tablespoons of rough, whole mustard seeds. A handful of finely chopped chives. Or use scissors to snip them. Let's make a little detour to discuss the value of a pressure cooker. They have two main virtues. Firstly cooking anything from a chicken, to a soup, or a stew takes a third of the time. It's a huge saver on that commodity that is in such short supply; that which waiteth for no man or woman. And secondly, a pressure cooker means a significant saving in energy. If every family bought and regularly one, most countries could close down one power station. And you could afford to buy several books that have been looking too expensive. It's really not difficult now. Make it in a jiffy. Take a pile of chicken bones that you've been collecting from the freezer. Drop them preferably into a pressure cooker, cover with boiling water and bring to double temperature for about ten minutes. Whilst the bouillon is cooking and cooling, peel and chop the onion, heat the butter in a deep pot and fry the onion lightly and slowly on a low flame. Add a touch of garlic if you like, but not too much. Even a slither of chilie for variation. Once the pressure has dropped in the cooker, strain the bouillon into the pot and bring to the boil. Add the mustard seeds and the cream and simmer gently for a few minutes. Add a little sea salt and freshly ground pepper to taste. Healthy choice foods points out that soups from a can are loaded with salt and often a load of chemicals in the form of flavour enhancers and preservatives. Plus the plastic lining of the can is carcinogenic, suggests some research findings. For a little variety, try adding a little smoked salmon or trout. Or, if you live in South Limburg, then you might find in their echte, real, limburgse mosterdsoep slithers of smoked eel. Delic and rich in omega 3 fatty acids for your aching joints and muscles. Suffering from hot flushes, or simply wanting to reduce your animal protein? Right thing to do, along with hormone replacement therapy, research in the Netherlands fingers high animal protein as the main causes of breast cancer. 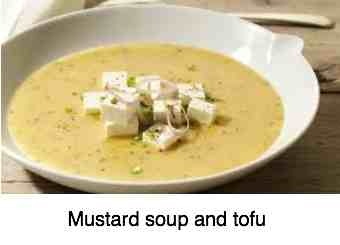 About one minute before your Limburg mustard soup is done add a few cubes of tofu. Rich in plant oestrogens, tofu is the reason why women in the east have much less trouble from hot flushes, opvliegers as they are called in Holland. On a chiropractic site we are always looking to decrease the omega 6 fatty acids in the diet, seed oils in the main, and increase the omega 3 fatty acids. You find them mainly in fatty fish like salmon, mackerel and eel and the best vegetable source is freshly ground flaxseed. To reduce the inflammation in your body, in your arteries, muscles, joints and gut you want to decrease the ratio of omega 6 to omega 3. That means more fatty fish, flaxseed and walnuts. Return from Limburg mustard soup to Bernard Preston homepage.